Apply Integrated Pest Management principles as the first choice. Read, understand and obey the pesticide label. Only use pesticides for which the proper Personal Protective Equipment is available, and use it properly. Handle, mix and apply pesticides according to label instructions. Know poisoning symptoms and first aid procedures. Observe recommended withholding periods (pre-harvest intervals) to ensure that harvested crops do not exceed maximum residue levels (MRLs). Follow recommendations when transporting, storing, disposing of pesticides and cleaning up any pesticide spills. One of the most fundamental premises of IPM is also one of the most important concepts of responsible use. This is that every effort should first be made to prevent the need for pesticides and that they should only be used as a last resort. Prevention, preventing the occurrence of pest problems before they can cause economic damage or require an intervention, is by far the most preferred and most responsible tactic. 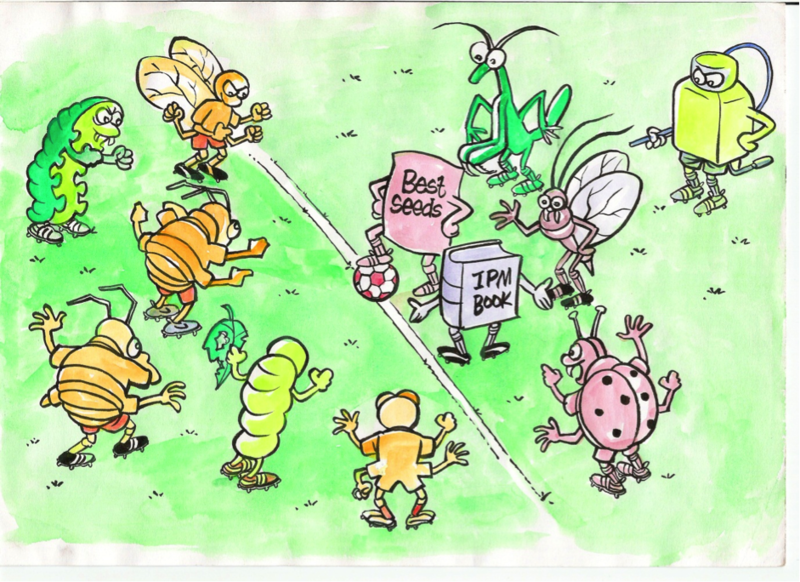 The concept is illustrated in the cartoon below in which IPM is represented by the soccer team on the right, who are up against the pests on the left. The IPM team use knowledge (the IPM book), grow resistant varieties (best seeds) and make use of the control of the natural enemies of pests (predators and parasitoids). The last line of defence, the goalkeeper, is the sprayer who represents the use of pesticides. By law in most countries, all pesticides sold must have a label, and users must read and obey it. In most countries, for example, it is illegal to use a pesticide on a crop unless the crop is listed on the label. It is also illegal to exceed the given rate of application on the label. Reading and understanding the label should be your starting point for responsible use once a decision has been made to use a pesticide as a control tactic within your IPM programme. The label should give you all the information you need for observing the rules of responsible use. It will tell you how dangerous (hazard category) the chemical is by hazard classes (PDF). The label will give you some idea of what personal protective equipment you should use (precautionary statements), often through the use of pictograms. It will provide information on handling, mixing, and application and may include recommended equipment. The label should also tell you the last date before harvest that it is safe to apply the chemical. This is known as the pre-harvest interval or the withholding period. The label will usually give you advice on what to do if the chemical is accidentally swallowed or spilled. In the first module on health risks of pesticides we presented a simple formula – Risk = Toxicity x Exposure. This relationship tells us that one way to decrease health risks is to reduce exposure to chemical pesticides. Avoiding exposure is the primary function of Personal Protective Equipment (PPE). Choosing the proper PPE for any activity involving pesticides starts with reading the label. By law, all legally registered pesticides must tell the user if and what PPE’s should be used. This information is usually in the form of Precautions statements on the label and many manufacturers also use pictograms, to tell users what PPEs should be used when using their products. There are 2 critical rules associated with PPE’s. One is that if the required PPE’s are not available for a particular product, or if they cannot be used for various reasons (e.g. too hot, too expensive, etc. ), then the pesticide in question should not be used. The second is that if PPE’s are available and appropriate then they should be used correctly. Guidelines on Good Practice for Ground Application of Pesticides (FAO) which includes PPE advice. Handling is any activity that involves exposure to a pesticide. This includes mixing, transporting, storing, disposing, applying, or working on pesticide equipment. Of course, the primary concern when handling pesticides is for personal safety and there are a number of safety steps that any operator should make whenever pesticides are handled. Before applying any pesticide, he or she must decide whether the pesticide is really needed. If the answer is yes, the operator must minimize environmental risks by analyzing the situation and making informed decisions. Some of these decisions include what pesticide to use, what formulation of a particular pesticide is best, what application procedure will give the best result with the least risk, what is the best time to apply and how much pesticide is needed. Responsible use involves selecting the least toxic and least persistent pesticide that will give the desired result. It also involves following all label recommendations when mixing, loading or applying any pesticide. A key handling concern is the selection of the most appropriate application equipment, which commonly means what type of sprayer. When equipment is selected the user should consider the type of pest, the pesticide that needs to be applied and the recommended method of application. Additional considerations are the size and type of area to be treated. Proper maintenance of application equipment is important because the applicator wants to be sure to apply only as much as is necessary and only put it where it will achieve the desired effect. Applying too little is a waste of the product, puts pesticide into the environment unnecessarily and can accelerate the development of pest resistance. Applying too much raises costs and increases risks. Applying pesticides outside the target area is again an uneconomical waste of product and poses unnecessary risks. At http://www.aglearn.net/resources/resUse/pestAppMeths.pdf the AgLearn booklet on Choice of Pesticide Application and Methods can be downloaded. Several US universities such as Michigan, Colorado and others publish guidance on how to calibrate spraying equipment, but one of the easiest approaches is to set up your sprayer with the nozzles that are recommended, then measure a small area and mark it. If you mark out 10 metres x 10 metres, the area will be 1/100 of a hectare. For backpack sprayers this would be OK, but for tractor-mounted machinery you would need a larger area, say 50 metres x 50 metres (1/4 hectare). Fill the sprayer with water (not spray liquid) and then spray the area you have marked out. Then find what volume you have used by looking at the marks on the tank or by measuring the volume to re-fill the sprayer. It is then easy to calculate your volume application rate. Once you know this, you can calculate how much of the concentrated pesticide to put into the spray reservoir tank. For example, if your volume rate was 400 litres per hectare and the pesticide label recommended 2 litres of product per hectare, the 2 litres must be mixed into 400 litres of spray liquid. If your volume rate was 500 litres per hectare, the 2 litres of concentrated product would need to go in 500 litres. We all know, however, that accidents happen – no matter how careful we are. People who use or work around pesticides, or people like participants in this on-line learning who are working with farmers who are using pesticides, must therefore be familiar with the signs and symptoms of poisoning. They must also know appropriate first aid procedures that should be applied while waiting for medical help. First Aid information is generally printed on the pesticide label. The AgLearn site gives Information on what to do if something goes wrong, and someone is affected by pesticide. The first thing is to avoid risking your own health or other bystanders by acting rashly. Then remove contact exposure removing the person from the scene of spillage or other contamination. Avoid further skin contact and remove contaminated clothing and use large volumes of water to wash away the pesticide. This is especially important if the eyes are touched by chemicals. First Aid, including signs and symptoms of poisoning are dealt with in the file given above. In almost all cases the person who has been contaminated with pesticide will need to be taken to a medical facility for a check-up. It is a good idea to have an emergency phone number on your mobile when working with chemicals. One of the primary regulatory responses to promoting responsible pesticide use has been to establish maximum residue levels (MRLs) which are the legal maximum quantity in mg/kg, of a pesticide present in food. Any agricultural product with residue levels above this limit may not be legally sold or traded. This MRL mechanism helps to verify that products have been used according to the label, and ensures that health risks are minimised. MRL’s are established as a part of the approval process for pesticides, and establishing these values involves performing trials to determine what levels of residues are present at harvest, when the product is used as directed (by following label instructions). The residue levels found in these trials help regulators to decide the value of the MRL, and the figures are usually incorporated into national food laws. Any produce with levels above the MRL is considered to be illegal and must be destroyed. There are generally large margins of safety between allowable exposure in the diet and levels of exposure which could cause health concerns. The reason for setting and enforcing MRLs is not so much to establish safety or health limits, but to make sure that pesticides are used responsibly and according to the label, and enable national and international food trade to take place. chemicals applied too close to harvest time. consumption by a human or animal after post-harvest use. Most pesticide manufacturers include recommended withholding periods on the product label, generally under ‘Directions for Use”. There may be a temptation use residue issues to manipulate the market when countries or regions are in competition for sales, and sometimes MRLs have been used as barriers to trade for economic reasons, rather than food safety reasons. To prevent or reduce such conflicts an international body created under the Food and Agriculture Organisation of the UN, and the World Health Organisation, and known as ‘Codex Alimentarious’ was charged with setting international residue standards for food including chemical residues in food. If any such conflict occurs it is the role of the World Trade Organisation (WTO) to intervene using its Dispute Settlement system. Of course, the actual application of pesticides on the farm is only one of several activities in which people need to observe responsible practices. Safety must also be a prime concern when transporting pesticide products from the manufacturing site to the retailers and then on to the farm. After production, during their journey to users and upon reaching their final destination they will need to be safely stored. On many occasions pesticides, or their containers, will have to be disposed of in a manner that will cause the least impact to human health or the environment. Finally, accidental spills do occasionally happen, and when they do, they need to be treated in an appropriate safe manner to minimise the risk. Below are links to a number of documents that provide detailed information on all of these activities. Participants may also want to go through the following agLearn tutorials (the first three links) below. The US EPA website at http://www.epa.gov/opp00001/health/spills.htm gives guidance on actions and legal responsibilities if a spillage of pesticide occurs.